Since China began an era of market reform three decades ago, many Westerners believed that, political liberalization and, eventually, democracy would follow. However, contrary to Western expectations, China remains an authoritarian country and the communist party is still in power, even though the country has witnessed rapid economic growth and its people have become richer. 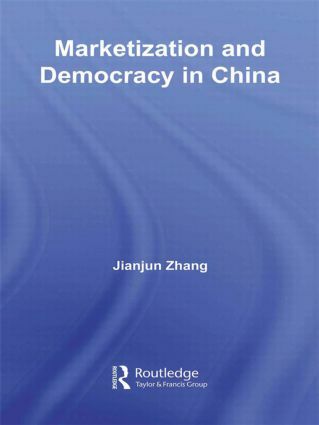 In Marketization and Democracy in China, Jianjun Zhang questions whether China’s market reforms have created favorable social conditions for democracy, whether the country’s emerging entrepreneurial class will serve as the democratic social base, and the role of government in the process of transition. Based upon a careful analysis of two regions—Sunan and Wenzhou —the two prototypical local development patterns in China, Zhang finds that different patterns of economic development have produced distinct local-level social and political configurations, only one of which is likely to foster the growth of democratic practices. The results suggest that China’s political future is largely dependent upon the emerging class structure and offer a warning on China’s development: if market reforms and economic development only enrich a few, then democratic transition will be unlikely. Marketization and Democracy in China will be of interest to scholars of Chinese politics, political science and development studies.